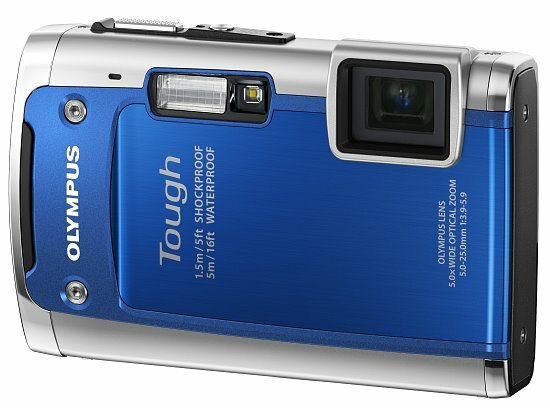 CENTER VALLEY, Pa., January 5, 2011 - Olympus, known for its robust line of ruggedized digital cameras today has added the new Olympus TG-610 and TG-310 Waterproof, Shockproof and Freezeproof models. They build on the Tough series' reputation of delivering amazing images while enduring extreme expeditions and everyday adventures, including life with kids. Whether at the local pool, a tropical reef or the ski slopes, consumers want a camera tough enough for life's thrills. The new Tough cameras come packed with a variety of new features that deliver a worry-free use, anytime, anywhere. "Because life's an adventure, you need a camera that's tough enough to make the journey with you," said Jennifer Schmell, product manager, Olympus Imaging America Inc. "When you're swimming with the dolphins, the powerful underwater functions like Underwater Snapshot Mode and Underwater HD Movie in 3D will ensure that your trip is more memorable than ever before." The TG-610 and TG-310 shoot gorgeous 720p HD videos above and below the water's surface, so you'll always capture the moments you cherish in clear, crisp high-definition at the touch of a button. With HDMI Control, playback is also a breeze. Gone are the days of friends and family huddling around your camera's tiny LCD to see the pictures and movies you just captured. Now, you'll be the hit of the party or any family event when you proudly display your brilliant images and movies on high-definition televisions. Simply connect the camera to an HDTV with an optional HDMI cable. With HDMI Control, you can use your HDTV's remote to control playback functions and navigate the camera's menus from the comfort of your couch. The TG-610 and TG-310 are equipped with in-camera Magic Filters that enable users to enhance and customize images as they're being captured. Have more fun and get more flexibility without expensive and time-consuming computer software. Magic Filter Movie is a powerful new feature that allows you to apply Magic Filters to your high-definition movies to take them to a new level of artistic expression and put you in the director's chair. New! Punk - create two-tone images full of rock and roll spirit. Underwater White Balance, eliminating the need to adjust white balance under water, a Macro LED, a convenient function for capturing close-ups in dark places and an Underwater 3D Movie function. Both cameras feature a water-repellent lens coating to prevent water droplets from forming on the lens, enabling you to get crystal-clear shots no matter how wet the shooting environment. To go even deeper, the optional underwater case for the TG-610 (PT-049) enables photographers to explore the fascinating world underwater up to 131'. Taking lots of photos is a vital part of any vacation, but it's no fun to lug around a digital camera if you are constantly worried that it might break. The TG-610 and TG-310 can withstand a 5-foot drop, thanks to their shock-absorbing technology, which minimizes the impact on the lens and circuitry, so they'll take more punishment. These vacation-ready digital cameras can take a beating and keep up with just about any active lifestyle. There's no need to think twice about bringing it along on a mountaineering trek or letting the kids take a few pictures at a picnic. Even for shots at the beach or capturing the wonder of marine life while snorkeling. Whether you're cruising the Alaskan ice highway in a snowmobile or building a snowman in your backyard, the new TG-610 and TG-310 can still perform when the temperature dips well below freezing (14 degrees Fahrenheit; -10 degrees Celsius). Enjoy consistently sharp and vivid high-resolution images in freezing situations where most traditional cameras would fail. Portrait and group shots make your vacation photos live beyond the short event, and with Face Detection you'll capture even the most bashful relatives. The TG-610 and TG-310 can detect up to 12 faces within the frame and automatically focuses and optimizes exposure to capture sharp, brilliant portraits and group shots. Even more remarkable, the TG-610 and TG-310 come equipped with Beauty Mode. Designed to touch up the appearance of your subject's skin as the photo is captured, enhancements that typically would necessitate retouching in a graphics editing program. Whether you've got skiers or surfers in your sites, the AF Tracking technology on the TG-610 and the TG-310 locks your subject in focus and continuously adjusts focus and brightness whether you or your subject is moving, and is perfect for unpredictable situations like photographing skiers on a mountain, tropical fish while snorkeling or children at play in the backyard. There's even two newly designed "Pet Modes" for animal lovers, offering the ability to recognize the faces of a variety of breeds of both cats and dogs. Skating at night? You won't be the last one on the ice thanks to Intelligent Auto Mode. It automatically identifies what you are shooting (i.e., Portrait, Night + Portrait, Landscape, Macro and Sports) and adjusts the camera's settings to capture the best quality results. Amateurs can jump into this quick and hassle-free feature that does the thinking for them and produces incredible images. You take the TG-610 and TG-310 to places where you want to capture as much of the scene as you can. In-Camera Panorama mode makes it easy by capturing three images and stitching them together to create one amazing panoramic picture. Simply press the shutter button and slowly pan across the scene. The second and third images will be captured automatically and stitched together with the first image - resulting in one seamless panorama-size picture. To create the ultimate panorama, consumers can use the OLYMPUS [ib] software to stitch up to 10 images together. Olympus developed its exclusive TruePic III+ image processor for the demanding performance of digital SLR (single lens reflex) cameras. Olympus' enhanced TruePic III+ Image Processor produces crystal-clear photos using all the pixel information for each image to deliver superior picture quality with more accurate colors, true-to-life flesh tones and faster processing speeds. TruePic III+ also captures crisp, clear images at high ISO settings, which are traditionally associated with increasing image noise or producing grainy photos. Olympus' new spring 2011 digital compact cameras offer SD capability for up to 32 gigabytes of capacity. The Tough cameras come in a variety of colors: the TG-610 in black, red and silver and the TG-310 in blue, orange, red, silver and white - to suit everyone's style. Journalists interested in more information, review units, product specifications and High-Resolution images of the new Tough cameras should contact Jeff Hluchyj, Mullen Public Relations, 617-226-9939 or [email protected], or Jennifer Colucci, Olympus Imaging America Inc., 484-896-5719 or [email protected] or the Olympus Web site: www.getolympus.com.